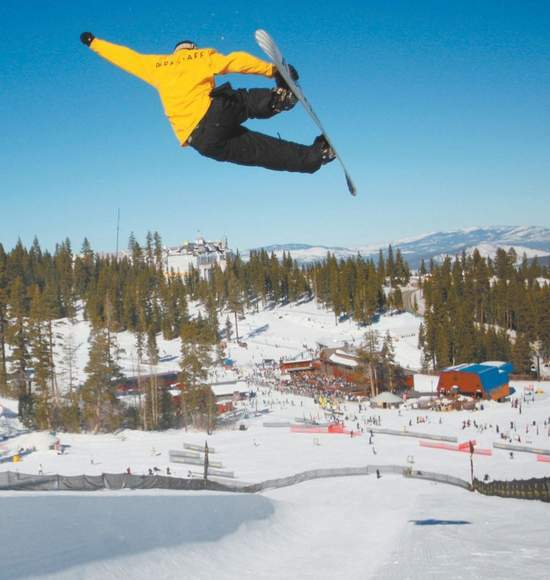 Sierra SunNorthstar terrain park director Chris Castaneda floats above the Ritz-Carlton at Northstar's mid-mountain halfpipe. The resort has 3,000 skiable acres and 19 lifts. EAGLE COUNTY, Colo. – Vail Resorts Monday announced it had acquired the Northstar-at-Tahoe Resort in North Lake Tahoe, Calif. According to a release from Vail Resorts, the price was $63 million.Vail Resorts acquired a long-term lease on the property – owned by CNL Lifestyle Properties Inc. – from Vail-based Booth Creek Ski Partners. Northstar is near Vail Resorts’ Heavenly Mountain Resort at South Lake Tahoe.”We are thrilled by the opportunity to bring Northstar-at-Tahoe into our family of world-class mountain resorts. With substantial and diverse ski terrain, a completely renovated and modern base village and outstanding guest service, Northstar-at-Tahoe has been one of the fastest growing mountain resorts over the past few years,” said Rob Katz, chairman and chief executive officer of Vail Resorts, in an e-mailed statement.While the acqisition comes just weeks before the first lifts run, the e-mailed announcement from Vail Resorts stated that the Epic Pass will be good at the resort, as well as at neighboring Sierra-at-Tahoe, which is still owned by Booth Creek. People who have already bought season passes for Northstar and Sierra can trade them in for Epic passes. The trade will put an average of $100 into passholders’ pockets.Industry consultant Jerry Jones of Avon said having Heavenly, Northstar and Sierra all skiable with the Epic Pass will put nearby Squaw Valley under new competitive pressure.”It was a smart move on Vail Resorts’ part,” Jones said. “It’s like what they have in Colorado – the best value.”Jones said with the real estate market down these days, it’s a good idea for a company to put lot of people on its ski trails. With the resorts within about a three-hour drive of more than 18 million people in the San Francisco area, Epic passes should put a lot of people on those hills.”More people and activity could help your real estate business,” Jones said.Much of the undeveloped real estate at Northstar is controlled by Avon-based East West Partners. A large development plan for roughly 1,000 new housing units at Northstar went into Chapter 11 bankruptcy soon after the current economic slump began, but Harry Frampton, a founding partner of East West, said the project has new financing and emerged from bankruptcy in June of this year.”We’re ecstatic, obviously,” Frampton said of the Vail Resorts move. “Booth Creek did a fine job, but Vail Resorts is the largest ski operator in the world, I think. They can really help Northstar go to the next level.”Frampton said he believes skiing and real estate can complement each other, and is looking forward to seeing what Vail Resorts’ plans are for Northstar.”If you’ve got a great resort, you’ll sell real estate,” Frampton said. “On the other hand, I think it’s good for Vail Resorts to have a good real estate company there. We want each other to succeed.”Vail – based out of Broomfield – also operates Heavenly Mountain Resort on Tahoe’s South Shore as well as Vail, Beaver Creek, Breckenridge and Keystone.”We would like to recognize everyone on the Northstar-at-Tahoe team for their invaluable contributions to the success of this resort,” said Chris Ryman, president/partner of Booth Creek, and Betsy Cole, chief financial officer/partner of Booth Creek, in a joint statement. “We are proud to have been associated with such a talented group of individuals.”Vail resident George Gillett, chief executive officer of Booth Creek, as well as Ryman and Cole, will no longer have management positions at Northstar-at-Tahoe, Vail spokeswoman Kelly Ladyga confirmed Monday.”Chris, Betsy and the entire Northstar-at-Tahoe team have created an incredible success story in the resort industry,” Gillett said in a written statement. “My family and I are proud to have been associated with Northstar-at-Tahoe over the past 14 years.”Vail Resorts will begin an immediate search for a new general manager of Northstar-at-Tahoe, which will include both internal and external candidates, she said.